U.S. Ambassador to Bangladesh Earl R. Miller visited Cox’s Bazar from March 8-10 to observe U.S. government assistance in the region. Ambassador Miller visited both the local communities and the Rohingya camps, and met with government officials as well as UN organizations and NGOs operating in the region. The U.S. Embassy Dhaka, including the Consular Section, the American Center, Archer K. Blood American Center Library, and the EducationUSA Student Advising Center, will be closed on Sunday, December 16, on the occasion of Victory Day, a Bangladeshi national holiday. The American Embassy, including the Consular Section and the American Center with the Archer K. Blood American Center Library and the EducationUSA Student Advising Center, will be closed on Sunday, November 11, 2018 in celebration of Veterans Day, an American holiday. Bangladesh is critical to the United States in so many ways—we enjoy a robust trade and investment relationship, close cooperation on counterterrorism and peacekeeping, a strong development partnership, and extensive people-to-people ties. The American Embassy, including the Consular Section and the American Center with the Archer K. Blood American Center Library and the EducationUSA Student Advising Center, will be closed on Sunday, October 07, 2018 on the occasion of Columbus Day, an American holiday. Thank you for your hospitality in hosting this lunch. I appreciate your essential role in managing the engine of Bangladesh’s economy, helping to lift hundreds of thousands of workers out of poverty, and making Bangladesh a key player in global trade. 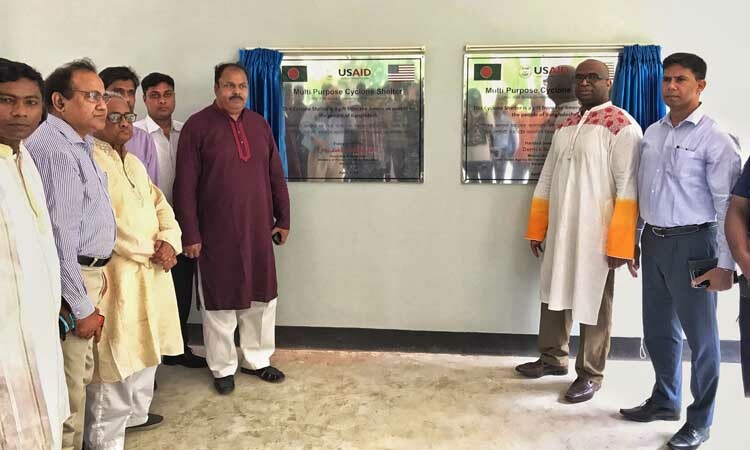 USAID/Bangladesh Mission Director Derrick Brown visited USAID development programs in the Jashore-Khulna region from September 18-20, including visits to key agriculture, labor and food assistance programs. The site visits were undertaken in collaboration with WordFish, WFP, Winrock International and World Vision Bangladesh among other implementing partners. The American Embassy, including the Consular Section and the American Center with the Archer K. Blood American Center Library and the EducationUSA Student Advising Center, will be closed on Sunday and Monday, September 02-03, 2018 on the occasion of U.S. Labor Day, an American holiday, and Jonmashtomi, a Bangladeshi national holiday, respectively. The American Embassy, including the Consular Section and the American Center with the Archer K. Blood American Center Library and the EducationUSA Student Advising Center, will be closed on Wednesday and Thursday, August 22-23, 2018 on the occasion of Eid-ul-Adha, a Bangladeshi national holiday. “American Ally in Development” Op-Ed by Derrick Brown USAID Mission Director, Bangladesh. New USAID Bangladesh Mission Director Derrick S. Brown arrived in Dhaka on Saturday, July 14 to take charge of his new duties. Before joining USAID Bangladesh, he served as USAID Mission Director in Angola from 2016 to 2018. We will continue to support Bangladesh as it tackles the new Sustainable Development Goals recently adopted at the UN General Assembly Meeting in New York. Our development partnership predates Bangladeshis independence in 1971 and has been exceptionally fruitful, producing tangible results that both the United States and Bangladesh can point to with pride. We are concerned by reports that at least 147 people have been killed and 21,000 arrested since early May by Bangladeshi security forces in a nationwide counter-narcotics campaign. We urge Bangladesh to conduct thorough and transparent investigations into all credible reports of extrajudicial killings. Administrator Green thanked the Government of Bangladesh for generously hosting and assisting nearly 700,000 Rohingya refugees who have fled violence and persecution in Burma since August 2017, and underscored the U.S. commitment to the humanitarian response to the crisis. The United States announces more than $44 million in additional humanitarian assistance to meet the urgent needs of Rohingya refugees in Bangladesh and people affected by violence and conflict in Burma. This brings the total U.S. humanitarian assistance for displaced people in and from Burma to more than $299 million. “It was absolutely critical for the Security Council to see the crisis in Rakhine State and the challenges facing Rohingya refugees first-hand." While in Bangladesh and Burma, Administrator Green plans to visit several sites where the U.S. Government is providing humanitarian assistance to displaced Rohingya and affected host communities. Under this public-private partnership, the EMK Center will serve as a non-partisan, non-political platform that encourages educational exchange and promotes Bangladeshi and American culture, entrepreneurship, human rights, and democracy. The American Embassy, including the Consular Section and the American Center, will be closed on Sunday, April 29 and Wednesday, May 2 in observance of Buddha Purnima and Shab-e-Barat, two Bangladeshi national holidays. Ambassador at Large for International Religious Freedom Sam Brownback will travel to Turkey and Bangladesh April 13-20 to discuss religious freedom with government officials, civil society representatives, and a range of leaders representing both majority and minority religious communities. His travel will include a visit to the Rohingya refugee camps in Cox’s Bazar, Bangladesh. Remarks by Acting Under Secretary Nauert at Bangladesh’s National Day Reception, Embassy of Bangladesh, Washington, D.C.
Bangladesh, the United States, and several other nations from around the world today announced their participation in the Shanti Doot 4 exercise to be held at the Bangladesh Institute of Peace Support Operation Training (BIPSOT), Rajendrapur Cantonment Bangladesh, February 26 – March 12, 2018. On Thursday, the U.S. Ambassador to Bangladesh Marcia Bernicat attended the “Combined DNA Index System (CODIS) DNA Database Training” graduation ceremony for 21 Dhaka Metropolitan Criminal Investigation Department (CID) officers. At this event, the Ambassador formally handed over the CODIS software to the Bangladesh National Police to enhance identification capability at their DNA laboratory. The U.S. Embassy, including the Consular Section and the American Center Library and EducationUSA Student Advising Center, will be closed on Sunday, October 8 on the occasion of Columbus Day, an American holiday. On October 3, Acting Deputy Assistant Secretary of State for Political-Military Affairs Michael Miller and Bangladesh Director General for the Americas at the Ministry of Foreign Affairs Abida Islam will chair the Sixth U.S.-Bangladesh Security Dialogue at the U.S. Department of State in Washington, D.C.
Friday evening, U.S. Ambassador to Bangladesh Marcia Bernicat celebrated the fifth anniversary of the Edward M. Kennedy Center for Public Service and the Arts (EMK Center). Joining the Ambassador were supporters and partners from academia, arts, business, civil society, the diplomatic community, and alumni of U.S. Department of State exchange programs. Over the course of the next few weeks or months, in response to the recent developments regarding the Rohingya population in Myanmar, demonstrations can be expected nationwide from different political, socio-cultural, and religious organizations. Read the full message (PDF 72 KB) PDF Files Require the Free Adobe Acrobat Reader . The State Department has updated its Worldwide Caution with information on the continuing threat of terrorist actions, political violence, and criminal activity against U.S. citizens and interests abroad. This replaces the Worldwide Caution dated March 6, 2017. Read the full message (PDF 42 KB) PDF Files Require the Free Adobe Acrobat Reader . On Friday, September 15, 2017, between the hours of 6:00am and 5:00pm, the Hefazat e Islam (HI) plans to hold country wide protests tomorrow against “atrocities against Rohingyas in Myanmar.” Read the full message (PDF 284 KB) PDF Files Require the Free Adobe Acrobat Reader . The American Embassy, including the Consular Section and the American Center with the Archer K. Blood American Center Library and the EducationUSA Student Advising Center, will be closed from August 31 to September 03 (Thursday through Sunday) on the occasion of Eid-ul-Adha, a Bangladeshi national holiday, and US Labor Day, an American holiday. US Acting Assistant Secretary of State for South and Central Asian Affairs and Acting Special Representative for Afghanistan and Pakistan Alice Wells arrives in Bangladesh for a two-day visit on August 29. The U.S. Embassy Dhaka, including the Consular Section and the American Center with the Archer K. Blood American Center Library and the EducationUSA Student Advising Center, will be closed on Monday, August 14, 2017, in observance of Janmashtami, a Bangladeshi national holiday. The U.S. Embassy, including the Consular Section and the American Center with the Archer K. Blood American Center Library and the EducationUSA Student Advising Center will be closed on Tuesday, July 4, in observance of U.S. Independence Day. The American Embassy, including the Consular Section and the American Center, will be closed from June 25 to 28 (Sunday through Wednesday) on the occasion of Eid-ul-Fitr, a Bangladeshi national holiday. On behalf of the entire staff of the Embassy of the United States in Dhaka, I would like to express my heartfelt sympathy to the families of victims for the tragic loss of life and property in the Chittagong, Rangamati and Bandarban landslides on June 13. The U.S. Embassy Dhaka, including the Consular Section and the American Center with the Archer K. Blood American Center Library and the EducationUSA Student Advising Center, will be closed on Sunday, May 28, on the occasion of Memorial Day, an American national holiday. Fellow stakeholders -- because we are all stakeholders; we have formed a unique group dedicated to strengthening the world’s foremost ready-made garment sector and the dedicated workers who play a key role in making the sector a world leader. The United States-Bangladesh Trade and Investment Cooperation Forum Agreement (TICFA) Council held its third meeting on May 17, 2017 in Dhaka, Bangladesh to promote expanded bilateral trade and investment in goods and services. The meeting was co-chaired by Shubhashish Bose, Secretary, Ministry of Commerce, Government of Bangladesh and Mark Linscott, Assistant U.S. Trade Representative. The American Embassy, including the Consular Section and the American Center, will be closed on Wednesday, May 10 and Thursday, May 11 in observance of Buddha Purnima and Shab-e-Barat, two Bangladeshi national holidays. First Lady Melania Trump and the Under Secretary of State for Political Affairs Thomas A. Shannon presented the 2017 Secretary of State's International Women of Courage (IWOC) Award today at the Department of State. The ceremony begun at 11:00 a.m.
First Lady Melania Trump and Under Secretary of State for Political Affairs Thomas A. Shannon will present the 2017 Secretary of State’s International Women of Courage Award to a group of extraordinary women from around the world today at the U.S. Department of State, including Sharmin Akter of Bangladesh. Please find greetings from U.S. President Donald Trump on the occasion of Bangladesh’s Independence Day. The American Embassy, including the Consular Section and the American Center with the Archer K. Blood American Center Library and the EducationUSA, Student Advising Center, will remain closed on Sunday, March 26, 2017 to celebrate Independence Day, a Bangladeshi national holiday. U.S. Embassy Dhaka will host a Facebook chat with Officer Bret Barnum from Portland, Oregon, who is in Bangladesh as part of a joint U.S.-Bangladesh community policing program. The chat will take place on Thursday, March 23 from 3:00 to 4:00 pm. Good morning! I can’t think of a better way to start the day than with some of Bangladesh’s brightest young leaders. So thank you to Korvi and to all of you for inviting me to be part of your National Youth Assembly. Over the past forty five years, Bangladesh has made tremendous progress in improving the food security of its people. We have witnessed remarkable gains in agricultural productivity to the point where Bangladesh is now almost self-sufficient in rice production. The U.S. Embassy Dhaka, including the Consular Section and the American Center with the Archer K. Blood American Center Library and the EducationUSA Student Advising Center, will remain closed on Tuesday and Wednesday, September 13-14, to celebrate Eid-ul-Adha. Violent extremism is a global threat. As we have seen too frequently, international terrorist groups can recruit and operate anywhere. I am here to offer U.S. assistance and support for Bangladesh's own efforts against terrorism and extremism. DHAKA, JUNE 23, 2016 – The U.S. Embassy launched a new website today in order to provide more user-friendly access to information about the U.S.-Bangladesh partnership, embassy programs, and applying for visas. DHAKA, JUNE 14, 2016 – Consul General Elizabeth Gourlay of the U.S. Embassy in Dhaka, Bangladesh held a press conference today to share tips on applying for U.S. visas. Ms. Gourlay also introduced a video produced by the U.S. Embassy in an effort to educate Bangladeshis about visa fraud and scams. DHAKA, JUNE6, 2016 – As another new moon heralds the start of the holy month of Ramadan, Michelle and I extend our best wishes to Muslims across the United States and around the world. As I hope you have learned from the décor tonight, the theme of our Independence Day celebration this year is "great rivers." Both our countries are blessed to lay claim to some of the world’s legendary rivers. These rivers have sustained and inspired Americans and Bangladeshis for generations. DHAKA, JUNE 2, 2016 – The U.S. Embassy Dhaka celebrated the United States’ Independence Day last night at a reception attended by more than 700 people. The Honorable Foreign Minister Abul Hassan Mahmud Ali graced the occasion as the Chief Guest. DHAKA, MAY 15, 2016 – U.S. Embassy Dhaka’s Facebook page gained its three-millionth fan on May 13, making it the first U.S. Embassy Facebook page worldwide to reach this milestone. DHAKA, MAY 3, 2016 – Assistant Secretary of State for South and Central Asian Affairs Nisha Desai Biswal will travel to Dhaka, Bangladesh this week. DHAKA, APRIL 14, 2016 On behalf of President Obama and the American people, I am delighted to wish a happy and prosperous New Year to Bengalis everywhere. We rejoice along with all those from Bangladesh, India, and around the world who gather today to celebrate the arrival of the new year. DHAKA, MARCH 31, 2016 - Two visiting United States official delegations accompanied by Ambassador Marcia S. Bernicat had fruitful meetings today with Home Minister Asaduzzaman Khan at the Ministry of Home Affairs. I am pleased to be with you today for this important event, and I thank you all for joining us. This conference has provided a valuable opportunity to take stock and assess Bangladesh’s accomplishments in combatting human trafficking. Good morning everyone! Thank you Ambassador Bernicat, Vice Chancellor Siddique, and Chairman Haque for the opportunity to join you here at Dhaka University. It is a privilege to visit this renowned institution, which was the beating heart of your people’s struggle for freedom, democracy, and independence. DHAKA, MARCH 28 – The U.S. Department of Homeland Security’s (DHS) Assistant Secretary for International Affairs Alan Bersin will lead an interagency delegation to Bangladesh that will include officials from DHS, the Federal Aviation Administration (FAA) and the U.S. Department of State. 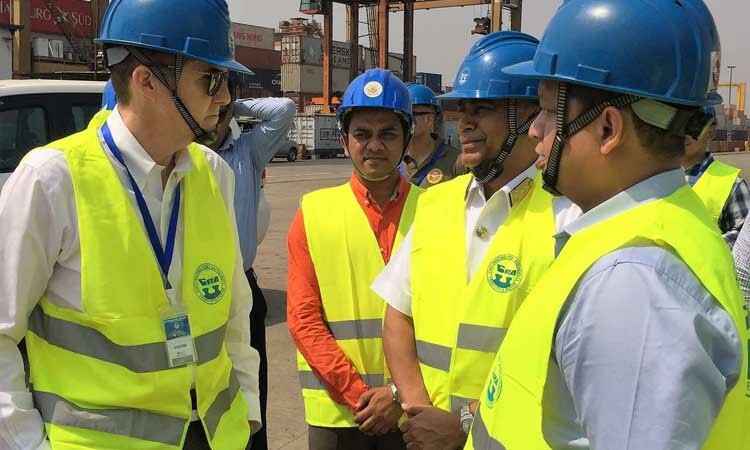 Dhaka, March 21, 2016 – A team from the U.S. Department of Defense’s Center for Excellence in Disaster Management and Humanitarian Assistance (CFE) has arrived in Bangladesh to collaborate on disaster management. This week, I am visiting Bangladesh as part of my first international trip in 2016. Why did I choose Bangladesh? Bangladesh’s growing economy and rising consumer demand make it a place where U.S. businesses want to compete. DHAKA, JANUARY 28, 2016 -- Religious liberty is an integral factor of American life, and has been since our Nation’s founding. Indeed, many of the first European settlements in America were comprised of individuals and families fleeing religious persecution. Good afternoon. Thank you for the chance to share some thoughts after a very engaging and productive convening of the Indian Ocean Naval Symposium. The opportunity IONS presents to meet with such an august group of naval leaders from the Indian Ocean region and beyond is priceless. I am so pleased to be here today to celebrate with you the induction of two beautiful Boeing 737-800s into the Biman fleet. I am so proud to know that these planes, two out of a fleet of ten new Boeing planes, will be part of Bangladesh’s extraordinary story of growth and exceptionally promising future. DHAKA, JANUARY 4, 2016 - In celebration of "Bangladesh World Tourism Year 2016," the EMK Center partnered with AJIYER Community-Based Tourism to launch a textile exhibition at the EMK Center. DHAKA, DECEMBER 22 – United States Ambassador Marcia Bernicat traveled to Cox’s Bazar to meet with district and local officials, undocumented Rohingya, registered Rohingya refugees, and organizations providing humanitarian assistance in the area. DHAKA, DECEMBER 20, 2015 – As part of the American Center Sports Diplomacy program, visiting Women's National Basketball Association (WNBA) star player and Olympian Gold Medalist Ruthie Bolton and U.S. Ambassador to Bangladesh Marcia Bernicat played an exhibition match and conducted a skills training with nearly 60 Bangladeshi youth athletes. Good afternoon. Thank you for joining me today, on what is my first trip to Bangladesh. I am particularly excited to visit just a few days before the commemoration of Victory Day. November 22, 2015, DHAKA – The U.S. Embassy, Dhaka Bangladesh is pleased to announce that on November 23, Assistant U.S. Trade Representative for South Asia Mike Delaney and Senior Secretary of Commerce Hedayetullah Al Mamun will co-chair the second TICFA Forum meeting in Washington, U.S.
Dhaka, November 1 -- The United States condemns the cowardly attacks on publishers and bloggers Faisal Arefin Dipan, Ahmedur Rashid Tutul, and two others in Dhaka on October 31. Our thoughts are with their families, friends, and the Bangladeshi people. Over the past two decades, Bangladesh has made tremendous progress in developing its natural resources for the benefit of its people. Since 1997, the U.S. Government and Government of Bangladesh have partnered to establish collaborative management—or co-management—systems for protected forests and wetlands, including the precious Sundarbans mangrove forest. I have been looking forward to speaking with the Diplomatic Correspondents because there are so many important stories to share about the U.S. - Bangladesh relationship. Our two countries have a common vision not just for our bilateral relationship, but for the region. Dhaka September 30: The United States Agency for International Development (USAID) today signed two new credit guarantee facilities that will make up to $22 million available to finance factory upgrades and safety improvements in Bangladesh’s ready-made garment industry. It is an honor and a privilege to be here today to speak with you about an issue of the greatest importance: improving the business and investment climate in order to strengthen the economic ties between the United States and Bangladesh. Dhaka, August 30, 2015 – The Bangladesh Armed Forces and U. S. Army Pacific announced today their participation in the Pacific Resilience Disaster Response Exercise and Exchange (PR DREE), a civil-military disaster preparedness and response initiative that is scheduled to run from August 30 to September 03, 2015, in Dhaka, Bangladesh. Thank you to the BGMEA for inviting me to join you today. The readymade garment sector, represented by the factory owners as well as the men and especially the women working in this sector, has been the engine behind the remarkable story of Bangladesh’s economic growth. DHAKA, MAY 5, 2015 – The U.S. Department of State strives to ensure the integrity of the U.S. visa process and takes all allegations of visa fraud seriously. The U.S. Embassy in Dhaka has noticed a steep increase in the use of fraudulent documents to obtain U.S. visas. The United States is gravely concerned by the ongoing unrest and violence in Bangladesh. We deplore the unconscionable attacks including bus burnings, throwing incendiary devices, and train derailments that have killed and wounded innocent victims.